If you were disappointed to learn there is no longer a San Francisco Ghirardelli chocolate factory tour (click to read our San Francisco Chocolates article for an overview of Ghirardelli and other chocolate in San Francisco history), we have some very good news for you. First, though, here’s a video of the chocolate-making equipment that still remains at Ghirardelli Square, a historical tourist attraction of sorts. And, here’s some more good news: it’s a very short video! There’s really no reason to be disappointed that Ghirardelli chocolate factory tours are not available in San Francisco because now you can take part in a very up-to-date, 21st century chocolate factory tour – a tour of Dandelion Chocolates, which is located in the Mission District neighborhood. What’s even cooler is that the tour (and tasting!) is free. Those two words – free and chocolate – go rather nicely together, don’t you think? The Dandelion chocolate factory tour is currently offered on weeknights at 6:00pm and on Saturday afternoon at 3:00pm, and you should review all the Dandelion tour details and make reservations at the preceding link. (The facility is open on Sunday for retail sales, although no tour is offered.) Dandelion Chocolate also has a kiosk at the Ferry Building — one of our top recommendations for a self-guided San Francisco food tour — which is located across from ever-popular Blue Bottle Coffee and next to the always delicious Humphry Slocombe ice cream shop. 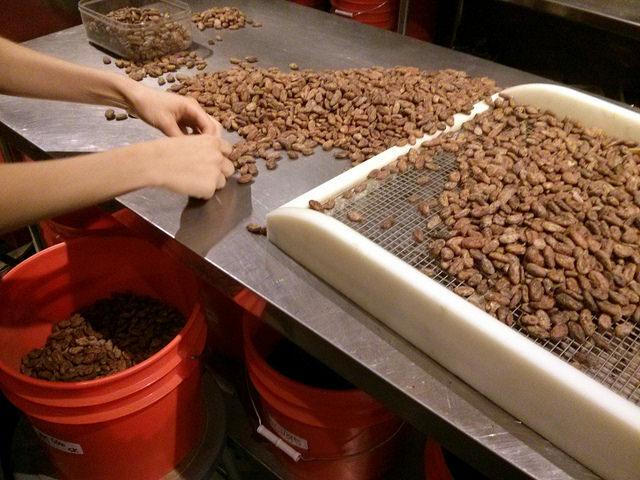 We enjoyed the TCHO chocolate factory tour a while back when the facility was located in San Francisco at Pier 17 (we wrote about the tour here), but TCHO moved its operation to West Berkeley not long after our visit. It took quite a while to get their TCHO chocolate factory tours up and running at the new facility, but GOOD NEWS: you can click here to get all the details on the tours! There are a few San Francisco tour companies and individuals that offer an organized introduction to some of San Francisco’s chocolatiers and establishments that put the beloved substance to good use, but it’s truly not too difficult to construct your own self-guided San Francisco chocolate tour, working in “chocolate fortification” stops along the way while you enjoy and explore other San Francisco attractions and activities. It’s really just a matter of what suits you. If you decide to go the self-guided route, our San Francisco Chocolates article (linked below) will help you locate some of The City’s best chocolatiers. It should also be noted here that it’s rumored Fog City News will soon offer chocolate classes and tours – covering topics like the origin of chocolate, how it is made and how to get the most from a tasting – so you may want to touch base with them before your San Francisco vacation or visit. If you’re wondering why a news stand might offer chocolate classes and tours, click here to read our San Francisco Chocolates article. Photo of Dandelion Chocolates tour by Cory Doctorow via flickr (Creative Commons).